Driving a convertible car with the top down gives drivers a stronger connection to the road and surrounding environment. In addition to great views and the feel of the wind whooshing through your hair, a convertible presents a stylish look that appeals to many. 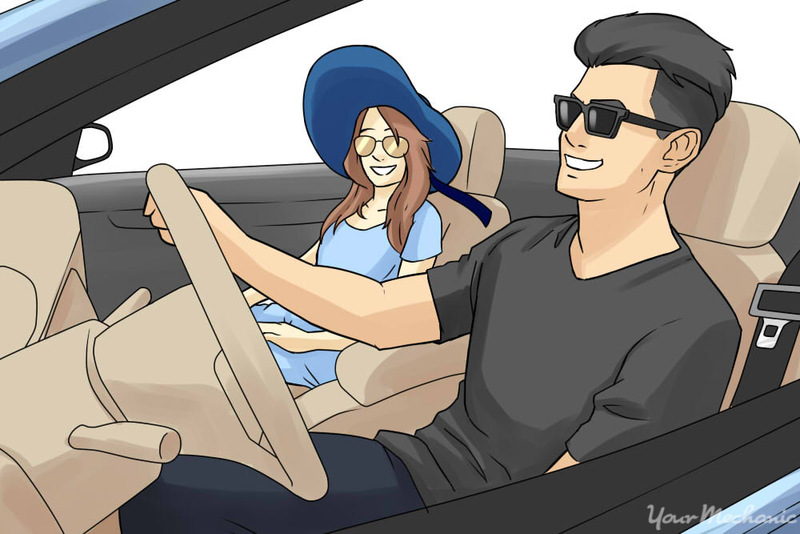 Usually, drivers only put the top down when the weather is nice, but by following some simple guidelines, you can drive your car with the top down year round. Driving with your convertible top down in cold weather might seem like a silly thing to do, but if the sun is shining (even if it's cold out) there is no reason to miss out on taking a beautiful ride through the city or on country roads. As long as you wear the appropriate clothing and use your vehicle's extra features to your advantage, you can enjoy the freedom a convertible offers when the weather turns cold. Warning: When not in use, make sure to close the convertible top for security. In addition to securing your car's interior from theft, putting up the top can also protect your vehicle from unnecessary exposure to the elements, including the sun and rain. Step 1: Dress to protect. The first step to shielding yourself from lower temperatures is dressing appropriately. Start off by dressing in layers. As you proceed through the day, the temperatures could rise or lower to the point that you need to shed or add a layer. A T-shirt underneath, followed by a vest or over shirt, all covered with a warm jacket provides extra protection. In addition, do not forget gloves to keep your hands warm, earmuffs for your ears, and a hat to keep your head warm. Also consider wearing sunscreen on your face and hands to protect them from exposure to the sun. Tip: If you expect to encounter high winds, put long hair in braids, cover it with a wrap, or do both. This can help prevent damage from exposure to the wind over a long period. Step 2: Keep the windows up. 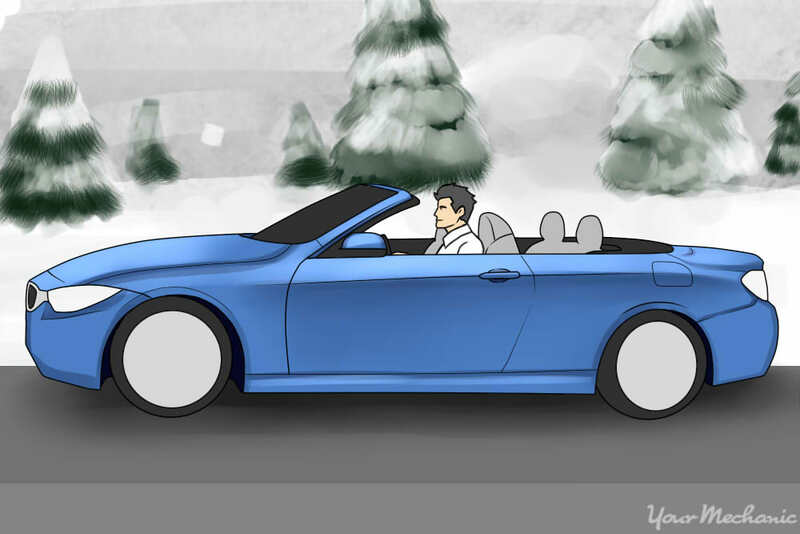 Rolling the windows up or down can provide some protection against cold winds while driving with the top down. And while the front windshield provides a lot of protection for the driver and passenger in the front seat, keep in mind any passengers in the back seat. More than likely they can expect to get the full brunt of the wind. Rolling up the windows can help protect them as well. Step 3: Use the rear windscreen. If your vehicle has one, use the rear windscreen to protect yourself from the rear turbulence often produced from driving on the open road. While it might seem small, the rear windscreen can also help protect any passengers sitting in the rear seats from buffeting winds. Step 4: Use your seat warmers. Take advantage of your vehicle's features, such as the heat or seat warmers, to help you keep warm while driving in the cold with the top down. While it might seem counterproductive to use these features when the top is wide open to the elements, convertibles are designed for such use, and you should use them to keep warm. While a hot summer day might seem like the best time to drive with the top down, you need to keep certain factors in mind to ensure that you protect yourself and your vehicle from the sun and heat. Just as too much cold can prove harmful, so can excessive heat, especially when you take into consideration getting dehydrated or sunburned while driving. By keeping certain guidelines in mind, you can ensure that you have a safe and fun summer driving season. Warning: One thing to look out for when driving with the top down in hot weather is becoming dehydrated. To help prevent this from happening to you or your passengers, make sure to drink plenty of fluids before, during, and after going on your drive. If the temperatures get too hot, over 90 degrees, consider putting the top up when driving to ensure your safety. Step 1: Dress appropriately. What to wear to beat the heat is an important consideration when driving with the top down. Some things to keep in mind include wearing breathable clothing, such as garments made from 100% cotton. Also consider wearing light-colored clothing, which helps redirect the rays of the sun. Sunglasses also come in handy when keeping the sun from blinding you, especially when driving in the early morning or early evening when the sun is closer to the horizon. Step 2: Use your windows. To help circulate the air, raise or lower your windows as needed to redirect the airflow in the vehicle. Just make sure any passengers in the rear seats are not being buffeted by high winds while driving on the open road. A rear windscreen can help deal with turbulent winds while driving. Step 3: Turn on the air conditioner if needed. 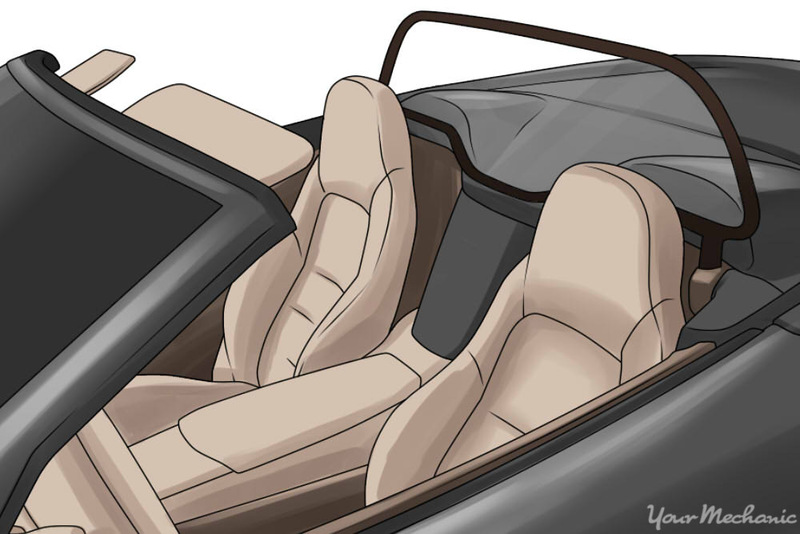 The air conditioner in some convertibles is designed to keep the interior cool even with the top down. Most often this means you need to drive with the windows up, but it provides a great way to keep cool on hot days. Tip: For ultimate all-weather protection, consider purchasing a hard-top convertible. Hard tops allow you to keep out the worst of the rain, snow, or other outside elements, while easily stowing away when you want to drive with the top down. 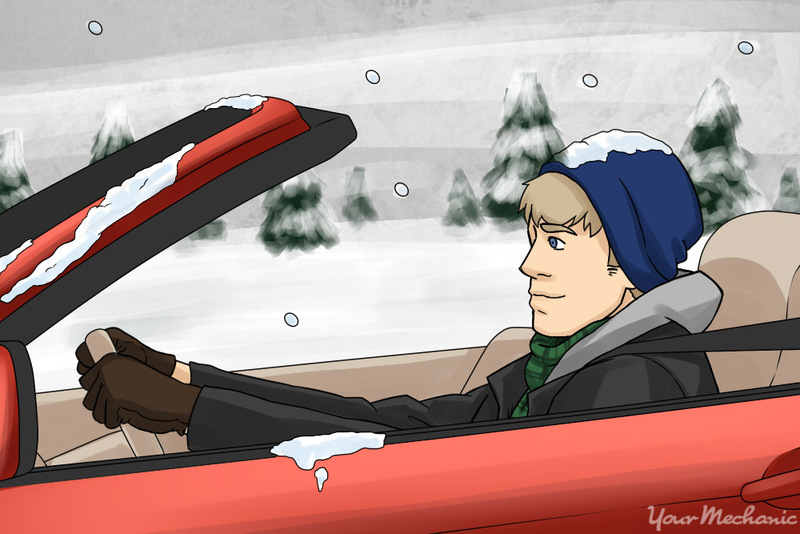 Driving with your convertible top down year round is an invigorating experience. Just make sure your top is in great shape so that you can raise and lower it when you need to. When maintaining a convertible soft or hard top, call an experienced mechanic to make sure that the job is done right. Then you'll be able to enjoy the fresh air and sights and sounds of the open road every day of the year.